company’s association with Bull Tractor. Following Bull Tractor’s untimely demise, Toro shifted its focus to the mowing industry. It was then, in 1919, that Toro was approached by the Minikahda Club in Minneapolis to create a motorized fairway mower to replace horse-drawn equipment. By mounting five lawn mowers onto the front of a farm tractor, Toro developed the Standard Golf Machine and helped create the motorized golf course equipment industry. Today, Toro is a global leader of innovative turf and landscape maintenance equipment and water-saving irrigation solutions to help customers enrich the beauty, productivity and sustainability of the land. Through a strong network of professional distributors, dealers and retailers in over 90 countries, Toro proudly offers a wide range of products across a family of global brands to help golf courses, homeowners, professional contractors, agricultural growers, construction and rental companies, government and educational institutions — in addition to many leading sports venues and historic sites around the world. Toro takes great pride in helping its municipal customers achieve the superior results they desire. This is accomplished through Toro’s extensive product line that ranges from 32-inch walk-behind professional trim mowers, up to 16-foot-wide riding Groundsmaster rotary mowers that can mow over 17 acres an hour. Other products include highly maneuverable zero-turn and quad-steer mowers for increased productivity and getting those hard-to-reach areas in a single pass, along with the versatility to quickly be converted from mow to snow to expand the utility of the mower. For street and parks departments in northern climates, Toro ensures that many of the mowers are equally accomplished at clearing snow and ice, with proper attachments such as plow blades, snow blowers, salt spreaders and rotary brooms available for even more utility. Toro’s mid-range and heavy-duty Workman vehicles are built for the tough jobs, like hauling dirt and sand, top dressing, performing maintenance jobs, transporting, towing, grooming, debris clearing and landscape remodeling. This includes a new automatic version that eases training for new operators. 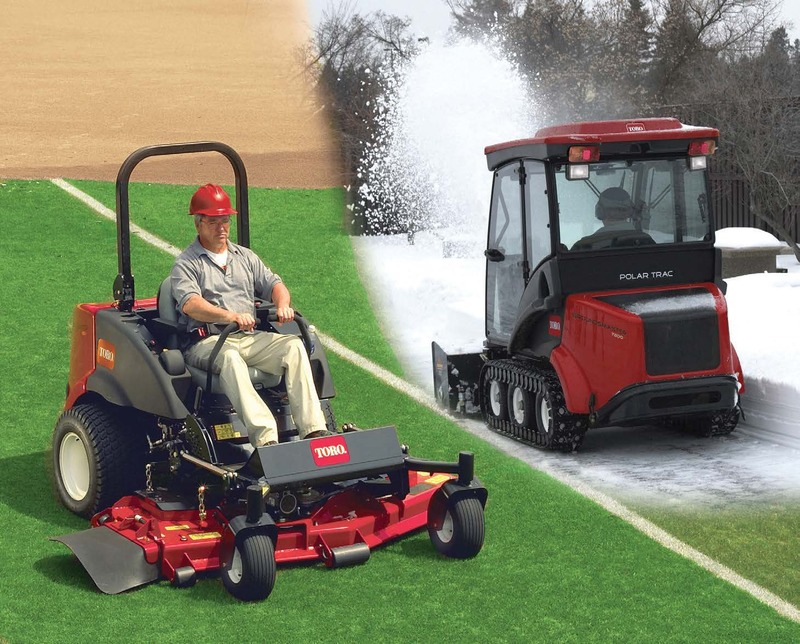 Toro’s infield groomers with attachments, such as the flex groomer, save time in maintaining parks and recreation fields while increasing consistency and playability. A full line of products for municipal golf courses are also produced, including greens mowers and fairway mowers — like the new Reelmaster 5010-H Hybrid — along with application, aeration, and debris management equipment. Other products include Toro’s water-saving irrigation controllers, sprinklers and soil sensors — in addition to ground-engaging equipment such as trenchers, augers, compact utility loaders, horizontal directional drills and construction equipment. Financing is available to facilitate any purchase, and training is offered by the company on all equipment in order to provide customers with ease of operation and ensure that Toro’s superior products conform to expectations. Governmental entities may purchase Toro’s full line of equipment and services through tcpn Contract R141201. This contract has been competitively bid by a government agency serving in the lead agency role. To learn more about tcpn, please visit www.tcpn.org. For more information and details on the complete line of Toro products, visit www.toro.com or contact the Toro dealer in your city. Information provided by The Toro Company.